OH, another, IS IT WORTH IT? Raphael was one of the first young men we met in Mangu. He was living with his siblings and single Mom. He had just been sent home from school for fees. We hired him so he could begin saving for his fees, but one volunteer came forward and assisted him in school. Now he is on his own and dong GREAT!! 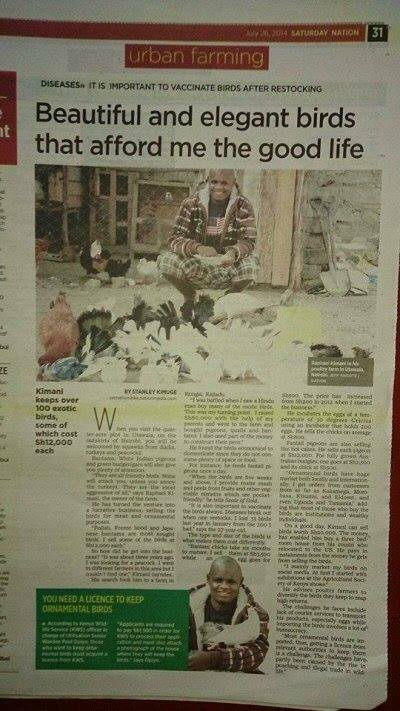 Featured in the Kenya Newspaper, The Daily Nation, as a special poultry Farmer!!! WAY TO GO RAPHAEL!!! This is what your donations do – Change LIVES!! He had little hope of finishing high school. With his determination and your help, he is a leader!